Hello all, Alison here from Words and Pictures. I hope you've all been enjoying a peaceful and prosperous festive season. This is my favourite time, I think - the quiet period once the major work is done, and you have the 12 Days until 6th January to rest, read, recuperate and enjoy peace and candlelight. Not too much rest though... there's always inspiration to play, and I've arrived at Terminal 4 of Destination Inspiration this week. I have to confess I was panicking slightly at the notion of Festive Berries - those who know me will know that red is not a shade which appears very often round my way. But once I'd come up with the notion that I could use the Festive Berries for actual festive berries, I felt a bit better! 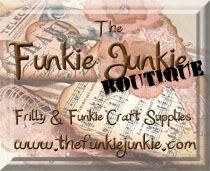 So here's what arrived on the craft table. I love working with ATCs, and I suddenly had the brainwave of trying to work with one of Tim's punches as my mask. 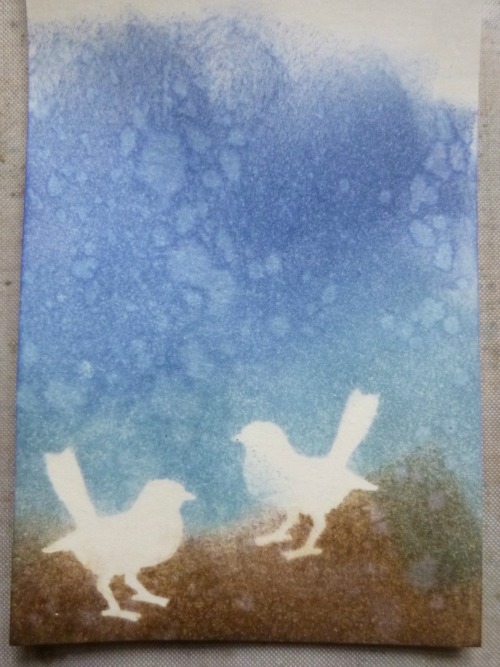 I figured the little bird would be the right sort of size to work with for an ATC. 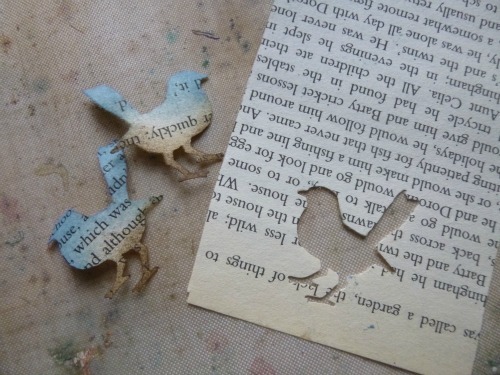 Same tricky process for the stamping - those birds are small and, because I'd punched them out of book pages (first thing to hand, not really thinking ahead), a little fragile too. But not so fragile that I wasn't able to save the masks to use on another project (as those of you who've seen my Snowflake ATC will know!). 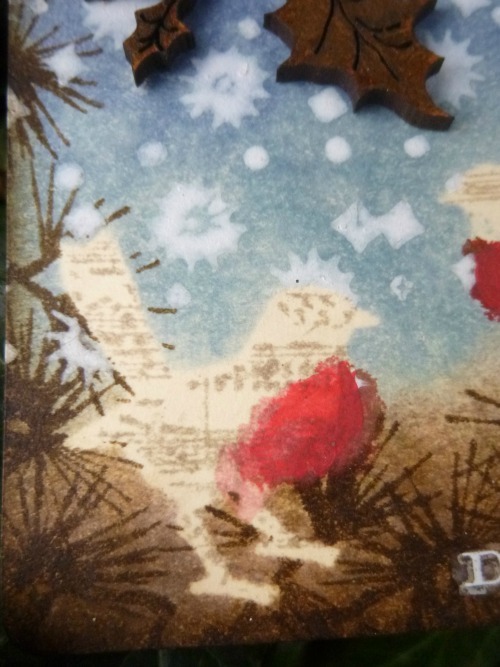 I stamped the starry snowflakes from Tim's Christmas Magic set in Picket Fence Distress Stain, and for the reverse masking, I thought the birds really ought to be musical, so I stamped some tiny music notation in Pumice Stone. I love that one of the birds has ended up accidentally wearing a little starry crown! 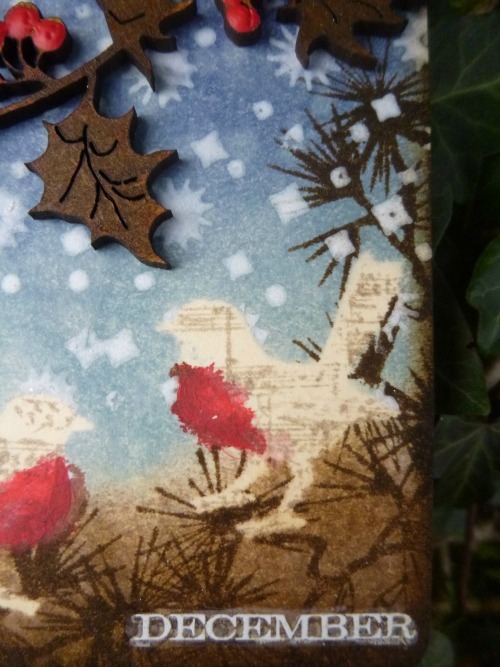 I then used the gorgeous pine needles from the Winter Sketchbook set to create some plant texture below and around the birds. 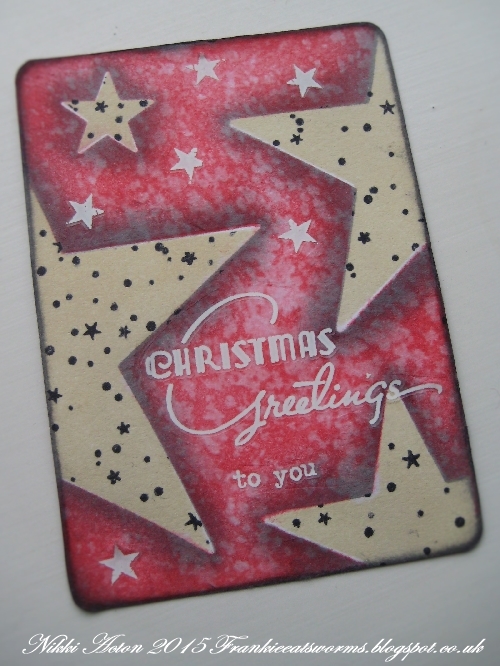 The pine needles are stamped in Ground Espresso, and you can see where the Distress Paint snowflakes have resisted the Distress Ink needles. 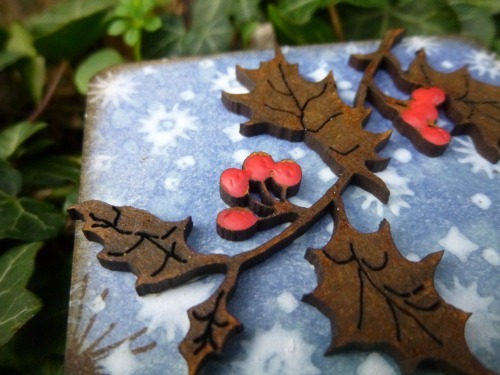 Ah yes, the berries... they're on one of the fabulous Calico Craft Parts - a spray of holly which I've painted with Ground Espresso Distress Paint so that it would tie in tonally. Then it was time for the vivid berries. 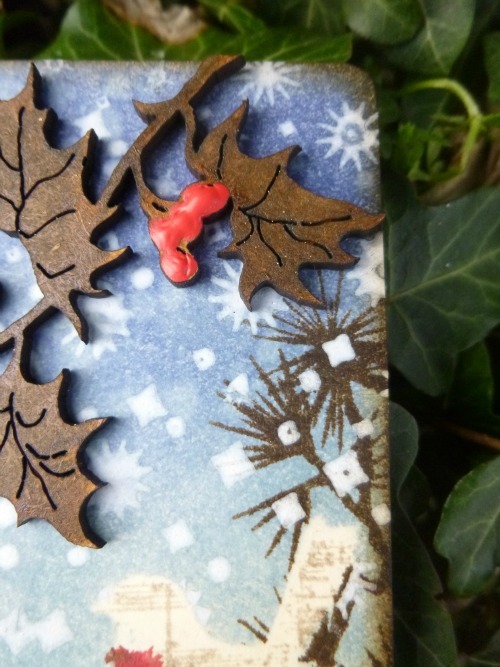 Although I have the ink, I don't have Festive Berries Distress Paint, but I found that the PaperArtsy Fresco paint in Cherry is an almost dead ringer in terms of colour, so I used that, applied quite thickly to get nice rounded berries. And that's the paint I used to brighten the robins too. I almost forgot the final requirement - my Remnant Rubs were hidden at the bottom of the bag! - but just in time I realised I needed to add a little transfer somewhere. 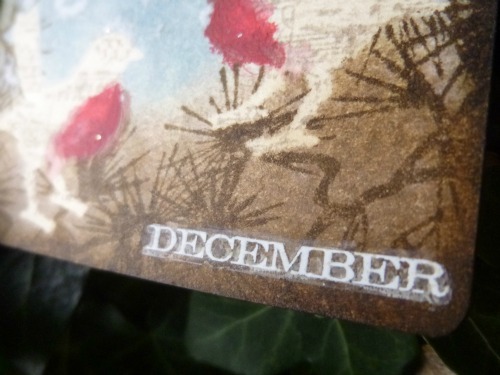 The gorgeous white December text seemed perfect for my wintry little ATC. As you may be able to see, I mounted it on one of the nice thick Calico Craft Parts ATC blanks - love how this gives it substance. So, as promised, here's the full selection of what the Creative Guides have been making on their travels this month. I hope you've enjoyed travelling as much as we have this month. 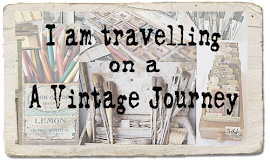 You've got just a few days left to join in with Annie's lovely Vintage Christmas challenge, and with a prize voucher from Country View Crafts and the honour of being one of our Pinworthies all at stake, we hope you'll come and play along. But do keep celebrating your own Twelve Days of Christmas too! 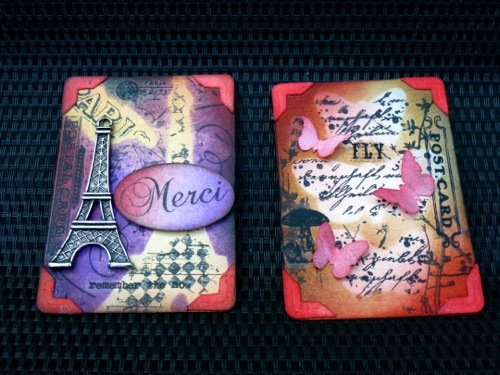 A wonderful ATC Alison, the splashes of red bring it all to life, just beautiful! 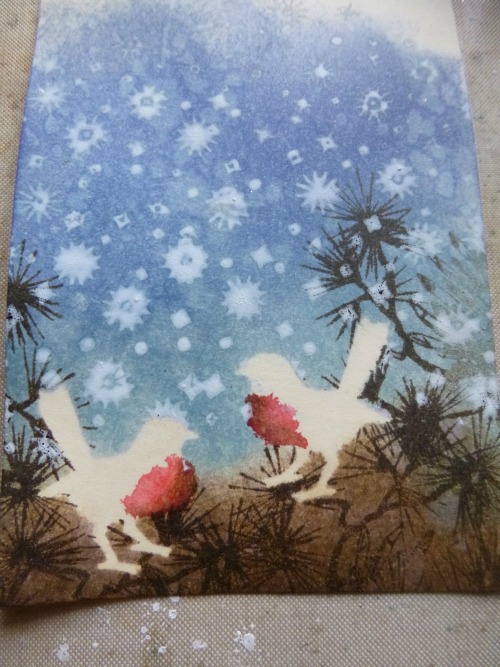 This is just beautiful - I love the little birds and the touch of red is gorgeous, really adds to the festive feel. 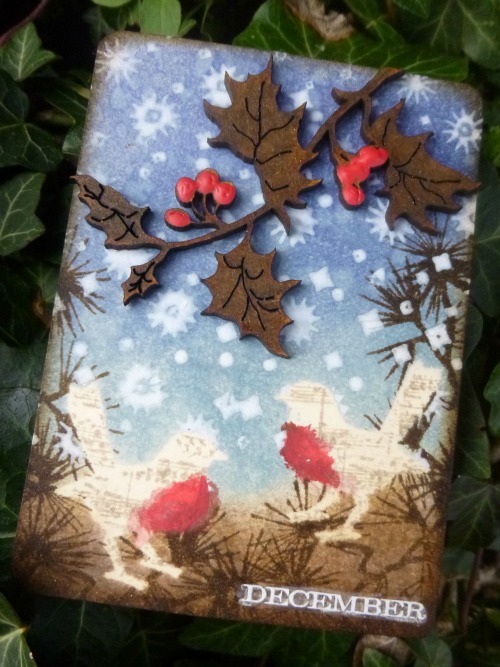 A wonderful wintery ATC Alison using the contents of the luggage bag. A clever way of extreme masking using the punches . Really love the scene you have created. 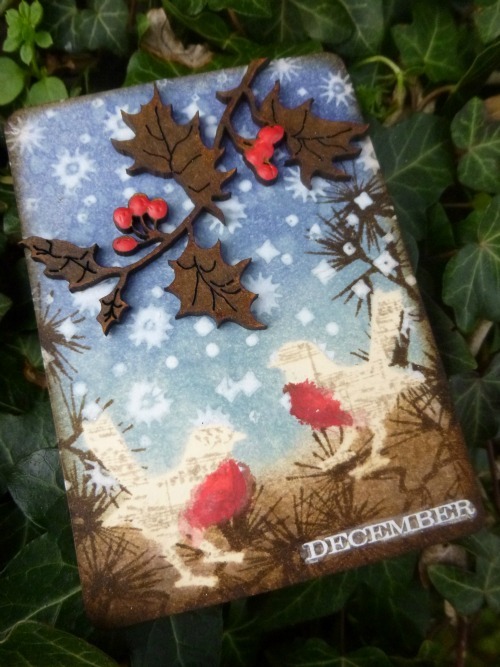 The dark brown tones of the inking, stamping and calico parts draw the eye in perfectly to admire the beautiful wintery sky and you chatty robin redbreasts. Not the easiest of contents to work with but all 4 of you talented ladies have risen to the challenge amazingly - produced fabulous ATC's and provided so much inspiration ! Beautifully done Alison - I love it!!!! Gorgeous ! I especially love those little birds ! Wow! It looks super amazing. My co-workers at http://www.paperwriting.xyz/ that saw these photos while I was reading your post, told that it is very beautiful. Totally in a winter holiday mood. Alison! 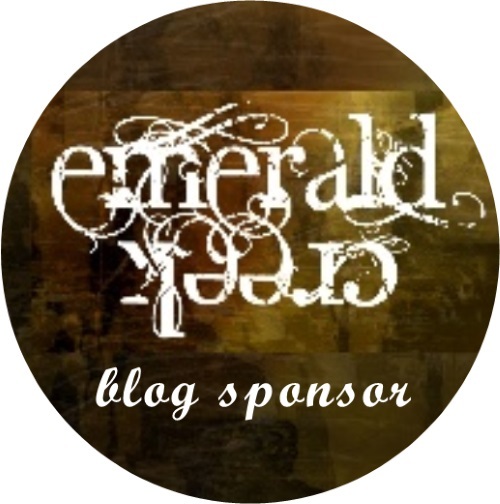 Thanks so much for sharing the steps of this mini tag! I love it!! Cheers and good wishes for 2016!